Ernesto Diaz-Infante, Chris Forsyth /guitar, piano, little instruments. If among the instruments of free improvisation the saxophone is still the king, the guitar is surely its impatient prince. It’s an instrument which lends itself to preparation, modification, manipulation and other sorts of abuse; it attracts disaffected rockers, folk musicians and punks like the sax draws jazzers. As a result, guitar-driven projects like those represented on these three disks are often quite different in flavour from reed-based ones. 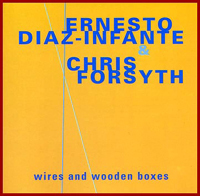 Diaz-Infante and Forsyth’s album inhabits a similar sound-world, and a very different one from their impressive first disk, which was as dense with sound as a Caspar Brotzmann set. These, on the other hand, are free improvisations in the most stagey sense, explorations of the sonic possibilities offered up by a studio containing not only their guitars but also a piano, a piano soundboard and a variety of other objects. Most of the disk is taken up with duets between Diaz-Infante’s acoustic guitar and Forsyth’s electric. As might be imagined, the disparity between the two instruments invites comparisons with the rich pageant of guitar timbres offered by Misere et Cordes, but in fact the two are closer in sound that that suggests; indeed, it’s often difficult to separate them despite the fact that they play quite distinct instruments. The tendency to explore textures at length which the quartet eschews is exploited to the full here, and although this makes the music relatively less full of incident, it does render it more approachable. 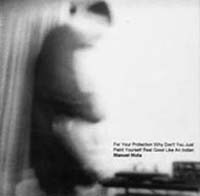 There are also three tracks featuring other instruments, but again, because of the extremely non-standard approaches taken to them, they tend to blend in with everything else. There’s none of the subtleties of Diaz-Infante’s piano compositions here; it’s all percussion, at some times furiously active, at others so quiet as to force you to strain to hear. These contrasts help give the music large-scale shape, but the details are as impenetrable as those presented by the quartet discussed above; like theirs, this is thorny music which bristles with energy even at its quietest. Forsyth is not the most technically interestinng guitarist to listen to; he often sounds scribbly and gestural, as if making big movements to get his sound. Still, though, what he plays is interesting, and sometimes (the opening of “Pulled Wires”, for example) he finds interesting conventional notes and shapes in his determinedly primitive technique. One can wish for more of them, but that misses his point, it seems. Diaz-Infante remains an interesting and rather enigmatic multi-instrumentalist, and improvising isn’t the only thing he does or even, necessarily, the thing he’s best at. Still, the pair turn in a focussed set here. Manuel Mota is the most conventional of the players represented here, in the sense that he’s interested in melodic lines within a free jazz framework. He sounds as if he’s playing over-amplified and trying to be quiet, which is an interesting approach that can lead him into nice choices of articulation (it’s much easier to talk about this kind of music, you see; the frames of reference are readily available, whereas for the other disks discussed here they’re ambiguous, still half-formed and entirely controversial). Here as on his previous CD he’s working will excellent electric bassist Garcia. They share an aesthetic founded in conventional notes-playing but acutely aware of timbre. Her work is subtle, even secretive, but it makes a big impact, and helps sustain Mota’s soloistic approach.